As done in my previous Labs, I’ll use Ravello as main plaform to develop a complete stack for a cloud service – doesn’t matter if for private or public use, the stack will be the same. I’ll begin using Autolab 2.6 from Ravello blueprint to save some time, as this will be illustrated in this first post. Then, I’ll add a NSX component. In my previous post I built 2 clusters, one of them for management, the other one for production, resources to be managed by the first cluster, and NSX resided in the management cluster. So, it was double-nested, first by the ESXi, second by ESXi nested in Ravello. This means a heavy load of the whole environment. Other posts will follow, showing vCloud Director 8.0 install and AirVM for management, since vCD 8 doesn’t provide a GUI. I will jump the initial phase of Autolab deployment since it’s the topic of my next post (and many others around the Net). The follwing image is my lab. Please do not consider the last 2 ESXi, I needed them to perform the previous nested installation of NSX. Now we’ll begin starting the first 2 VMs, NAS and Domain Controller. As soon as they’re started, we’ll proceed with the remaing 3, the vCenter and 2 ESXis. We’ll turn on just 2 instead of 3 as per Autolab blueprint because I don’t want to destroy my previous vCenter environment, made, as described above, of 2 custers of 2. Anyway, 2 ESXis will be enough. Then import it in Ravello Library (if you didn’t before, you must download and install the GUI VM Import Tool). Accessing with the default credentials – admin/default – we’ll be presented with the home page, choosing “View Summary” you’ll have the main data screen. Be sure that the first 3 services are running – SSH is not important since we’ll configure it from this GUI. The tab “Manage” up right will allow you to configure the device. Starting with General, where to setup syslog server (optional), adjust NTP server if not already setup before, and locale settings. Moving down using the left side menu, we can set network (any modification will need a reboot as shown below), and SSL certificate will allow you to create a new one to send it to any Certification Authority, to upload an existing one, or just leaving the fake one generated during installation. 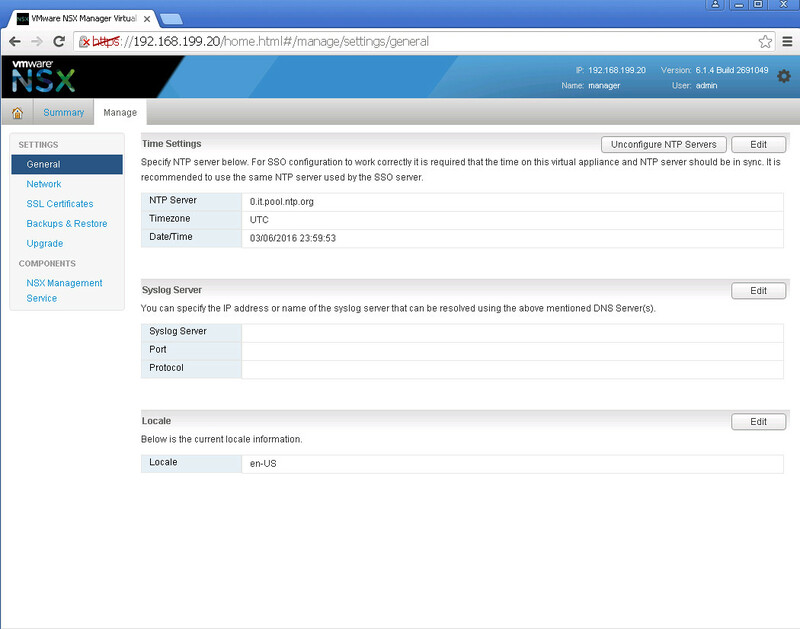 Now it comes the connection with vSphere elements – if NSX services are not started, the system won’t allow these settings. Lookup service will ask details for authentication to SSO (and acceptance of the server thumbprint): the success wil be shown with a green leed in “Status” line. Same procedure for vCenter connection – in this case, in addiction to the green led we’ll refresh the inventory clicking the arrows beside it. 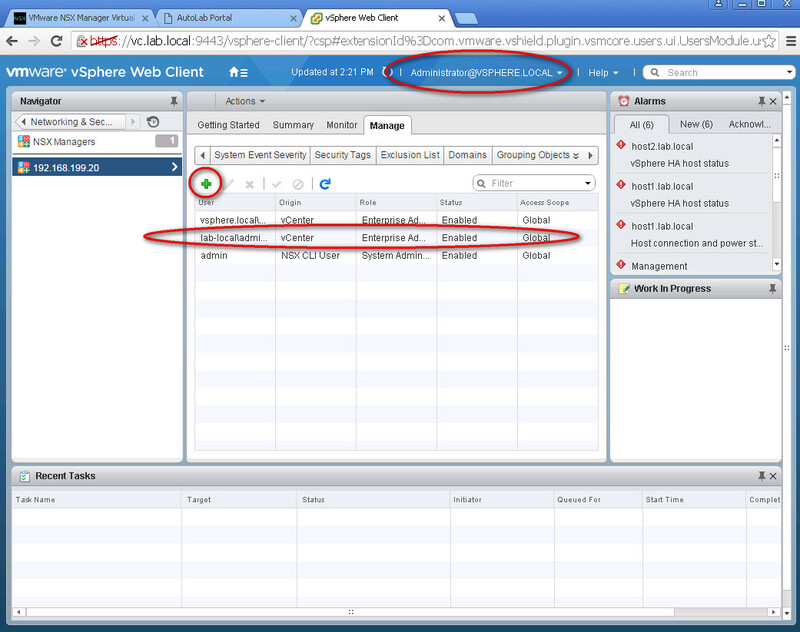 The whole NSX installation proces will end up adding a new item inside vCenter – using webclient, since C# one wn’t show it. Even if I settle up AD to be used as LDAP in vCenter, and LABAdministrator as enterprise global administrator, NSX didn’t allow me to make changes if not administrator@vsphere.local logged in. In the next part that will come in a few days, we’ll configure NSX in order to deploy Controllers, will prepare hosts, and deploy VXLAN and Edges. Following we’ll add vCloud Director and a GUI to manage it.